Are some things just too goofy to be an object of desire? I pondered this notion after a press release landed in my inbox about the Walkin' Bag, a roller bag with an integrated folding seat. Truth is, I noticed this product on the Internet before, have even seen people at airports wheeling one of these around, and I have to admit that part of me is curious — in the same way stiletto-wearing women eye a pair of Birkenstocks once in while. In this case, I could see how something like this would be useful for the infirm, elderly, or otherwise disabled. (Indeed, it was created by a man stricken with polio.) But I am none of those things, so why was I eyeballing this? 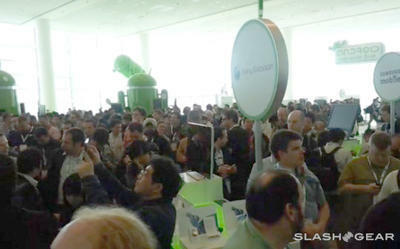 Then I spotted this pic by SlashGear. That's the beauty of the Walkin' Bag — it's perfect for those times when you're so pooped, you couldn't care less what you look like perched on this. Just kidding. To be honest, there are actually some decent-looking models, and maybe not everyone has to look like a tool sitting on one of these babies. It's also strong — really strong. The seat can support up to 300 pounds, and the handle is designed to bear weight, so you can actually lean on it. Now I wondered if this item was too big a stretch from the gadgety tech goodness most people come here to see. Then I discovered I wasn't the only techhead who had eyed this, as seen here, here and here. The reason is simple — this gear is just plain smart. 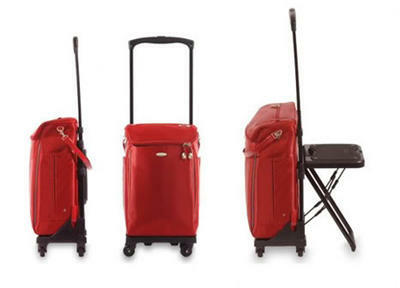 Starting at $125 (for models with built-in seats), the Walkin' Bag is also decently priced compared to other rolling bags. It's a must-have for conferences, long wait times at a hot new gadget launch, and other events. Have you got an odd product that you've been secretly coveting? Or one you think others should too? Let it out in the comments section below. If we like it as well, we may even feature it in an upcoming post.